Booking a holiday is always exciting, but before you’re able to relax by the pool and sip on that fruity cocktail, you need to get through the airport (sigh). 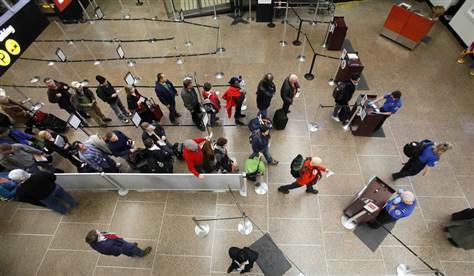 The check-ins, passing security and waiting around can be tedious and frustrating. How can extra preparations benefit you at the airport? Check the status of your flight. Checking this at the last second gives you an idea of when your flight arrives and if it’s cancelled or delayed. It’s always a relief when you’ve been queuing up for a long time and the line starts moving. But if everybody had their ID and boarding pass at the bottom of their bags, the line would move a lot slower. Keeping your ID, boarding pass and credit card all in one place means you can hand your documents over and finally be on your way to your destination. Also, this is a great way of double-checking you have all the important information you need. Check the news for frequent traffic updates a few hours before you’re planning on leaving – the last thing you want is to miss your flight. Once you’ve arrived at the airport, you’ll have to find somewhere to park your car. You should book a pre-paid parking spot as soon as you’ve decided to drive to the airport yourself. Alternatively, you could find out about valet parking. With this “meet and greet” service, you simply take your car to the departure area and your provider will then drive it to a secure car park nearby. And it’s just as hassle-free on your return. Call their team, and your car will be dropped off and back in your hands. Valet parking is provided as a service at many airports. For example, you can use meet and greet at Gatwick and other major UK departure points. It’s always best to find this out beforehand, so you can have it all booked and confirmed before the date of your departure. Standing around in the queue to check-in can be frustrating. All you want to do is to get rid of your suitcases so you can get through security and jet off on holiday. But the weight of your luggage could hold you back. It’s easy to check this before you join the line as scales are normally placed near the check-in area, meaning you can tell if your suitcase is the right weight. If you’re super organised and want everything prepared at home, then you could buy yourself a luggage scale. It’s inexpensive and will prevent any kind of hold-ups at the airport. You travel to the airport wearing your favourite accessories, raring to get going. But putting on your favourite jewellery, your best watch and your most stylish belt can be a pain when getting through security. All it means is that you’ll have to take them off again if they’re made of metal. To get through security faster, wear as little metal as possible. These little tips will swiftly guide you through the airport, leaving you to enjoy your flight.